*This Breakfast Potato Stacks post is sponsored by Idaho Potatoes and Country Crock. All opinions are my own. Eggs Benedict is one of my favorite breakfast dishes, so I wanted to put a fun twist on a recipe classic. This recipe requires a few steps to put together, but when you bite into one of these stacks, it will be worth the effort. You could easily substitute fried eggs with the poached, but the texture of a poached egg coated in tangy hollandaise sauce is pretty amazing. Homemade hollandaise might seem intimidating, but it’s really simple to make, just make sure that you whisk briskly the entire time for a nice, creamy consistency. 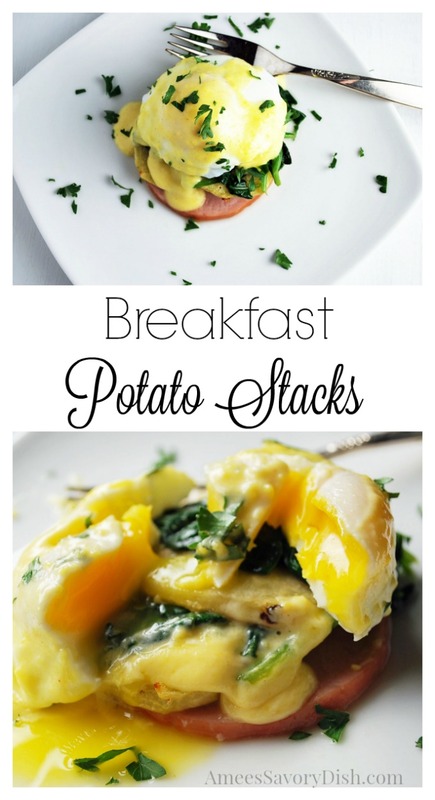 When you take a bite of these breakfast potato stacks, breakfast might become your favorite meal of the day. 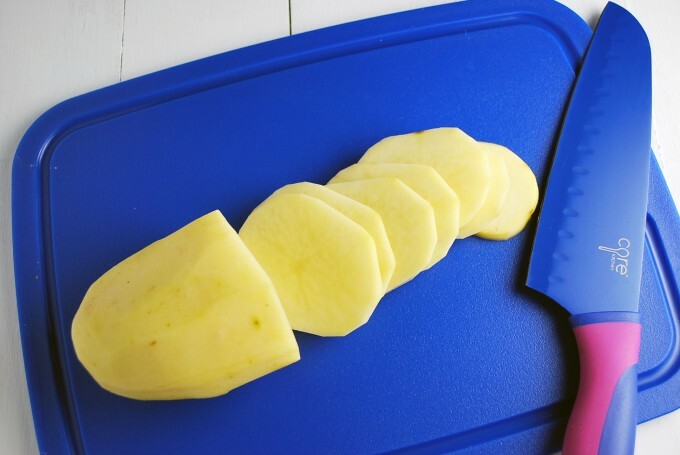 When preparing your potatoes, peel and slice them in 1/4 ” slices. This will ensure that all slices cook evenly. *Cutting board and knife courtesy of Core Home. Preheat oven to 450 degrees F. Wash, peel and slice potatoes into 1/4 “ slices. Melt 3 tbsp Country Crock original spread and toss with potatoes. Place potato slices on a baking sheet and cook for 20 minutes, turning after 10 minutes. While potatoes are cooking, heat a large skillet over medium heat and melt remaining 2 tbsp Country Crock spread. Add fresh spinach and cook until spinach is wilted. Remove from heat and place into a covered bowl to keep warm. Add Canadian bacon to pan and cook about 2 minutes each side,until just starting to turn lightly golden. To make hollandaise: Add water to a double boiler and bring to a full boil, then reduce to a simmer. Whisk egg yolks and lemon juice briskly in a stainless steel bowl until thickened and doubled in volume. Place yolk mixture in the double boiler and continue to whisk rapidly until mixture thickens. Slowly drizzle in melted butter while continuing to whisk until sauce is doubled in volume. Remove from heat and stir in dijon and cayenne pepper. To poach eggs: Fill a pot with a few inches of water and bring to a boil. Reduce heat until water is at a low boil, with only a few bubbles coming to the top. Crack an egg into a small ramekin or dish and gently slide the egg into the pot. Repeat this for remaining 3 eggs. Immediately cover with a lid, turn off the heat and set a timer for 4 minutes. Using a slotted spoon, carefully lift the eggs, one by one, from the water and place onto a plate. 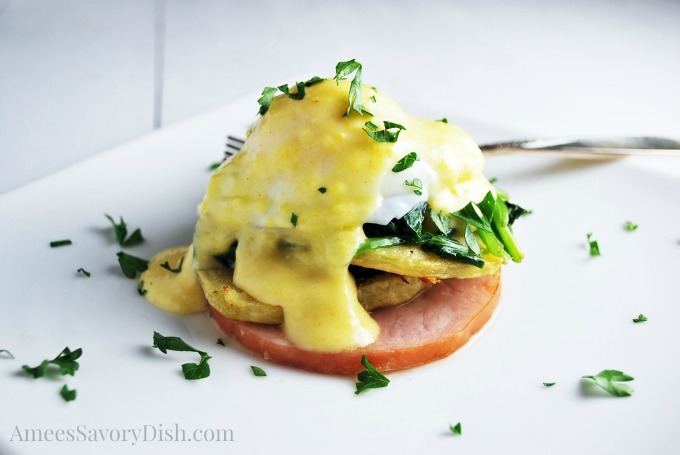 To assemble stacks: Place a slice of Canadian bacon on a plate, then add 1 slice of potato, then a heaping spoonful of spinach, a third slice of potato and top with a poached egg and 1 tbsp hollandaise sauce. You could always enjoy breakfast for dinner, too. Yummo! That looks delicious. I love your knife – never heard of that brand before!